Do you like lobster? Do you like gimbap? Then you’ll love this recipe: it’s simple to make and a real delicacy. I had always wanted to visit Maine to taste their great seafood: lobsters, crabs, oysters, and clams, so recently I took a road trip through New England. It’s a really pretty part of America, especially in the fall, and the seafood was really fresh and delicious. I tasted their local dishes and also cooked a few dished of my own using local seafood. I never travel without a few essential Korean ingredients, and with them I made this lobster gimbap. I didn’t have my gimbap mat with me, so rolling them took some skill. 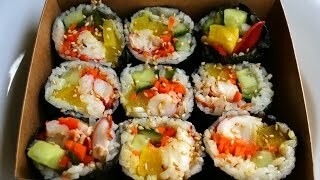 If you have a mat, check my traditional gimbap video for a clear demonstration on how to use it. I had never made lobster gimbap before, and as far as I know I invented it on my trip! It really turned out wonderful and I made it 2 or 3 times when I was there. I’m really looking forward to going back to Maine again, it’s a really nice place. A note on lobster cooking time: the local fish shop told me that the cooking time would vary based on how many lobsters I was cooking, how big they were, and whether they were hard or soft shell. For my 2½ pound soft shell lobster it took 20 minutes, but you can check their website for more detailed instructions for cooking other lobsters. Make rice by following my recipe. Put the freshly made rice into a shallow bowl or on a large plate. Gently mix in ½ teaspoon salt and 2 teaspoons sesame oil with a rice scoop or a wooden spoon. Let it cool down, so it’s no longer steaming. Cover and set aside at room temperature. Bring a large pot of water to a boil and add 1 tablespoon salt. Grab the live lobster and quickly put it into the boiling water head first. Drain the water and rinse off the lobster. Crack open every part of the lobster, remove all the meat, and put it on a plate. Kitchen shears can be useful for this, and be sure to remove the big vein from the back that runs the length of the lobster’s tail. Place a sheet of gim shiny side down on your cutting board. Evenly and thinly spread about ⅔ cup rice over top of it. Leaving about 2 inches uncovered on one side of the gim. Place cucumber, carrot, danmuji, and lobster strips in the center of the rice. Use your both hands to roll the the gim and rice over the fillings, so one edge of the rice and gim reaches the opposite edge. This centers the fillings in the roll, so they will be nicely in the middle when you slice it. Press tightly as you continue rolling the gimbap. Set the finished roll aside and repeat 2 more times with the remaining ingredients. Put some sesame oil on the finished rolls. Cut each roll into ¼ inch bite size pieces with a sharp knife. To make it easier to cut, occasionally wipe the knife with a wet cloth to clean off the starch. Put it on a plate and serve immediately or pack it in a lunchbox. Serve with soy sauce in a small bowl for dipping . Posted on Friday, November 14th, 2014 at 7:02 pm. Last updated on October 22, 2017. Posted June 19th, 2016 at 10:51 pm | Log in to reply. This looks SO yummy! My 6 and a half year old and I love your traditional gimbap recipe. (I try to make it for her at least once a month to take for school lunch.) Would this recipe work with crab legs instead of lobster? Posted June 26th, 2016 at 6:30 am | Log in to reply. Yes, crab leg meat sounds perfect! Posted December 22nd, 2014 at 10:09 pm | Log in to reply. 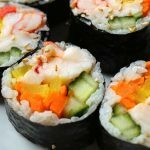 I can’t wait to try making your delicious lobster gimbap! It will be very refreshing to try something new after so many chowders! Posted November 19th, 2014 at 1:03 pm | Log in to reply. How do you like all the snow of recent? I love your rice roll recipe and will try it shortly with something other than lobster…(not in my budget) Keep up the fantastic work and I will continue to watch your great work. I was thinking of posting some of my own videos and hope they are as successful as yours. Posted November 21st, 2014 at 11:33 am | Log in to reply. Great! Good luck with your videos! Posted May 17th, 2018 at 5:52 am | Log in to reply. Do you have to eat/serve this straight after making? This recipe was originally posted on November 14, 2014 at 7:02 pm by Maangchi. It was last updated on October 22, 2017. The video was watched 1,086,210 times on YouTube & has 15,177 likes!